Butchering calves for the pleasure of diners is never going to be easy to stomach for some people. Such sensibilities should always be taken into account when preparing a menu. However, veal remains one of the best loved of meats by the Italians, and forms the central component of three of the nation's most famous dishes. Breaded veal, either using a chop or an escalope, or scaloppina, is synonymous with the northern industrial giant of Milan, and can be found in the company of a variety of side orders, such as spaghetti in a tomato sauce, some sautéed or chipped potatoes, or wilted spinach. For the crumb coating, all that is required are some beaten eggs, some plain flour and a bowl of breadcrumbs. But before that process can begin, the cook must lay their hands on a kitchen mallet, which is used to lightly pound the meat flat in order that it cooks both quickly and evenly. Milan is also the home of osso bucco, or veal shank, usually accompanied by the city's famous risotto whose golden colour is derived from the addition of several strands of saffron. The final of the three signature veal dishes hails from the Italian capital, Rome. 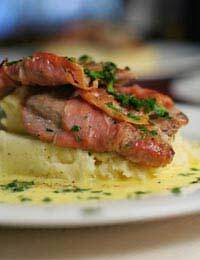 Saltimbocca translates as leap in the mouth, an apt description for these palate pleasing escalopes.